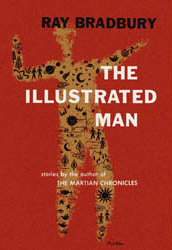 The Illustrated Man: Chapter Fifteen - Marionettes, Inc. - Jimmie Aaron Kepler, Ed.D. The Illustrated Man: Chapter Fifteen – Marionettes, Inc.
A man attempts to escape his marriage by replacing himself with a robot to fool his wife into thinking he hasn’t left and tells a friend about it. The man comes back and tells the robot to go back into the box, and the robot disobeys him saying he has fallen in love with the wife. The robot then proceeds to put the man in the box and goes to visit the wife.